Many breeders and stores sell unweaned baby parrots, claiming that finishing the hand-feeding and weaning process yourself will “guarantee a hand-tame bird” and “ensure bonding.” While this sounds compelling, it is not true! The seller’s true motivation is to save money; hand-feeding is labor intensive and eats up profits. Unfortunately, the mistakes commonly made by inexperienced hand-feeders often set up parrots for chronic physical and/or behavior problems that may increase the likelihood that they will be abused, neglected, unwanted, or abandoned at some time in their lives. 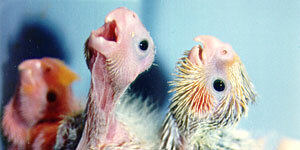 Young, unweaned birds are routinely removed from their parents at or shortly after hatching to be artificially reared by humans. This practice gained popularity under the faulty assumption that it was the best way to ensure that birds became “tame” and bonded with their human caregivers. The sad truth is that hand-rearing has meant misery for countless generations of birds. Hand-feeding, especially in the hands of inexperienced individuals, often leads to tragic complications, including infection, aspiration pneumonia (caused by food entering the lungs), burned or punctured crops (caused by forceful feeding or food that is too hot), malnutrition, or even death. Birds who are artificially reared are also more likely to develop behavioral problems such as excessive screaming, feather plucking, self-mutilation, and aggression. Research conducted at the University of California, Davis, showed that allowing parrot chicks to be raised by their parents and handled by humans as little as 15 to 20 minutes a day while in their parents’ care produced tame parrots without the physical and behavioral risks of artificial rearing. Further, many people have discovered that building a nurturing relationship with a parrot begins when the bird, no matter what his or her age or how he or she was reared, begins to trust. This is evidenced by the fact that parrot rescue groups successfully place hundreds of unwanted adult birds each year, despite their not having been weaned by their new caretakers. Pako was 8 when I got him and he’s the most intelligent, loving, affectionate, funny bird. All my older birds are love bugs, Georgie took some time, but he’s the best snuggler.